Butler’s Morgan Wright swings at a pitch during the Aviator’s 5-4 loss at Greenville on Monday. 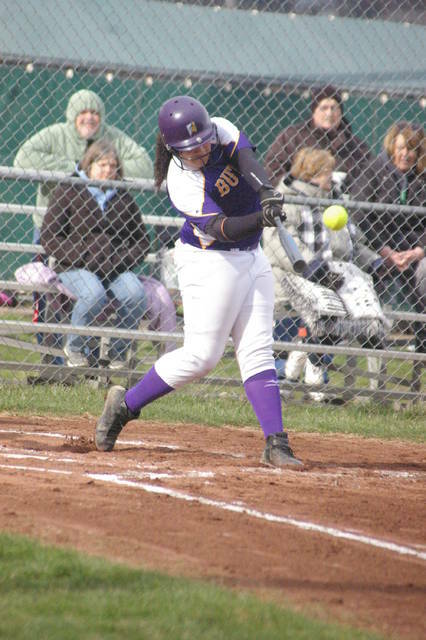 GREENVILLE – Vandalia-Butler had the potential winning run on base in the seventh inning Monday evening, but the Greenville softball team held on for a 5-4 Greater Western Ohio Conference victory. Butler proved it was ready to play from the beginning of Monday’s game, which included snowflakes falling throughout the contest. Lyndsay Achs led off the contest with a walk, took second on a passed ball and went to third on a bunt single by Katie Henry. Morgan Wright then drove in Achs with a sacrifice fly, giving the Aviators a 1-0 lead. Greenville didn’t take long to respond, however. Morgan Gilbert and Courtney Bryson led off the bottom half of the first inning with back-to-back singles. After Cassie Cromwell advanced both runners with a sacrifice grounder, Sydney Grote drove them both in with a two-run single into center to put the Lady Wave up 2-1. Greenville padded its lead in the second inning, adding two more runs. Nyesha Wright started the rally by reaching base on a Butler error. After a single from Gilbert, Cromwell drove in Nyesha Wright with a double into center. Grote then lined a pitch back up the middle and off Butler pitched Sydney Theobald, driving in Gilbert and putting Greenville up 4-1. Though Greenville was able to plate four runs in the first couple innings, the Wave could have brought in many more. They stranded nine runners including seven in the first three innings, which included leaving the bases loaded in the third. The Lady Wave’s missed opportunities could have hurt them as the Aviators mounted a comeback starting in the fifth inning. Achs led off the fifth with a walk then Henry reached on a Greenville error. Both runners stole a base then Achs scored on a wild pitch to make it 4-2. Moments later Henry scored on a sacrifice grounder by Morgan Wright to reduce Greenville’s lead to a single run, 4-3. Greenville added one more run, which proved to be the game winner, in the bottom of the sixth as Gilbert led off the inning with a double and scored on a single by Grote. Down 5-3, Butler kept the game interesting in the seventh. Henry led off the inning with a home run into right-center to reduce Greenville’s advantage to 5-4. A error allowed Amber White to reach base then Samantha Lentz had a one-out single to put the potential tying and winning runs on base. But Greenville got out of the jam with a grounder to third. Zoe Pressnall stepped on third and fired to first for a double play, ending the threat and giving Greenville a 5-4 victory. Greenville finished the game with 11 hits to Butler’s six. Greenville stranded nine runners while Butler stranded eight. The Wave committed two errors while the Aviators had one. Gilbert went 3-for-3 with a double and a walk for Greenville. Grote was 3-for-4 and knocked in four of the Wave’s runs. Lani Shilt was 2-for-3. Cromwell was 1-for-4 with a double and drove in a run. Baylee Petry was 1-for-3, and Bryson was 1-for-4. Nyesha Wright was on base twice, walking and reaching on an error. Petry pitched the first two innings for Greenville and Caitlin Christman pitched the final five. “Hats off today Christman coming in, throwing five great innings and pitching hard on her birthday, 16-year-old birthday today, and gets the game ball and the win,” Newland said. Greenville improved to 8-3 overall and 4-0 in the GWOC with the win. Butler fell to 3-5 overall and 2-2 in the league. This entry was tagged Butler, Greenville, gwoc, Softball, Vandalia, vandalia-butler. Bookmark the permalink.